For nearly 20 years, the Pomona College Museum of Art has been home to a series of exhibitions designed to turn a spotlight on emerging and underrepresented artists from Southern California. 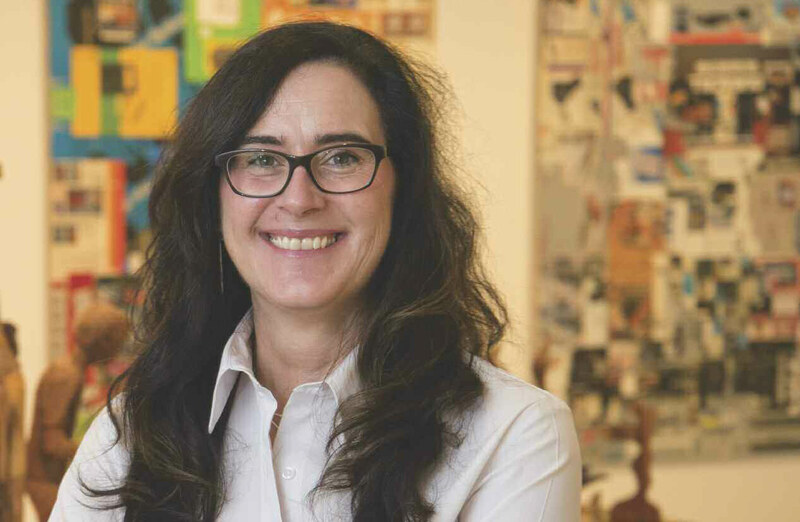 After 49 exhibits in what became known as the Project Series, senior curator Rebecca McGrew ’85 decided to take it up a notch for Project #50 by showcasing seven artists in concurrent solo exhibitions in “R.S.V.P Los Angeles,” which will be open through Dec. 19. “I envisioned collaborating directly with the artists who themselves were engaging with the contemporary cultural moment through a rich, boundary-blurring dialogue of art, culture, history, social issues, politics, music, science and more,” says McGrew on how the Project Series was conceived in 1999. Many of the artists who have been featured in the series have gone on to major national recognition. 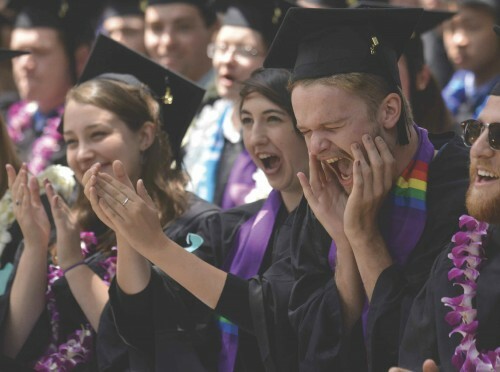 Members of the Class of 2015 show support for a classmate who just received a diploma during Pomona’s 122nd Commencement in May. During the ceremony, Michael Dickerson ’01, Andrew Hoyem ’57, Judge Stephen Reinhardt ’51, and France Córdova spoke and received honorary degrees from the College. Videos of the speakers are available at www.pomona.edu/events/commencement/archive/2015.aspx. It’s early May, and Pomona students are stressing out in droves over final papers and upcoming exams. But never fear—help is near, with a wagging tail and a droopy ear. 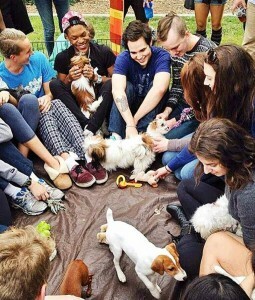 During the annual “De-Stress” event on the Smith Campus Center lawn, students take a little time off from studying to do something that is medically proven to reduce stress—that is, pet a puppy. For those allergic to doggie fur, the event also includes games, frozen snacks and plenty of pizza and camaraderie. 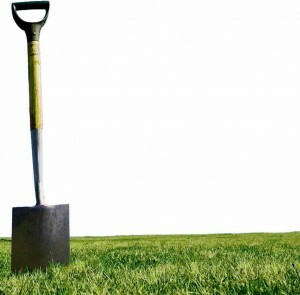 Drought is changing the face of Southern California, as more and more green lawns give way to desert plantings requiring a fraction of the water. At Pomona, turf removal hit a new high this summer, with the replacement of an additional 140,000 square feet (3.4 acres) of grass, according to Head of Grounds Kevin Quanstrom. Among the swaths of grass to be removed were areas around Alexander, Oldenborg, Hahn and Wig halls. Grass-lovers can take heart, however, that the broad, grassy lawn of Marston Quadrangle will remain green—at least for now. The spring tour of the Pomona College Glee Club took them to a range of performance spaces, from a high school gymnasium in New York’s Washington Heights to a retirement community in Stamford, Conn., to the Church of the Holy Trinity in Philadelphia. 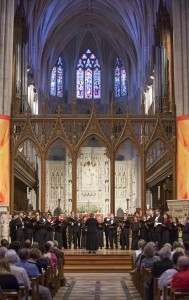 However, the undisputed highlight of the tour was a half-hour concert in the National Cathedral in Washington, D.C. 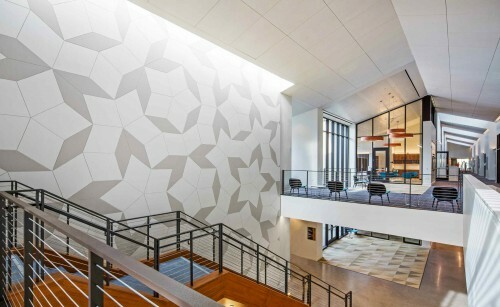 The focus will be on the wonders of physics, astronomy and mathematics during Pomona’s 2015 Founders Day, which will feature the official opening of the beautiful new Millikan Laboratory and the renovated Andrew Science Hall. The dedication ceremony is set to begin at 1:30 p.m., and to be followed by a range of interactive science and math activities for all age groups throughout the afternoon, ending around 7 p.m. Food trucks will be available for dinner from 4:30 to 6:30 p.m. The event is free and open to the public. One auditioned and was cast in a small role in the movie The Hunger Games (2012). One authored a neuroscience textbook in 11th grade: A Friendly Guide To The Adolescent Brain. One wrote five Apple Apps, which achieved 1,000,000 total downloads. One has written four full-length novels. One is a sous chef for a Michelin-starred restaurant. One is a master bee-keeper, the youngest in the state.